AAA Getaway Cleaning offers basic cleaning for daily, weekly, bi-weekly and monthly residential clients. We cover all areas in our checklist, however, some homes and commercial establishments require more attention in some areas and less in others. If this is the case, please communicate your priorities to us so we may focus our time correctly. First time cleanings may require more time. Please speak to your personalized Cleaning Associate with any questions you have regarding our residential/commercial services. Check out our Residential Cleaning Checklist. As with all our services, we will always be glad to provide you with an estimate as to total cost to you our valued customer. We are fully licensed and insured and only provide you with trained, experienced and professional employees. All our services are provided with a 100% satisfaction guarantee. If you are not completely satisfied with your cleaning, simply call Customer Service: (423) 839-4017 or (865) 805-2589 within 24 hours of your service and we will happily make the necessary adjustments if warranted. Your windows will always be cleaned on the inside. Our window specialists will clean the glass inside and outside as well as in addition to screens and tracks upon your request. The cost of this service varies depending on the level of detail. COMMERCIAL WINDOW CLEANING is one of our specialties. 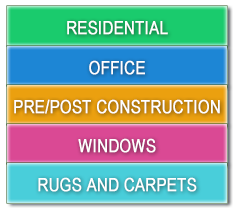 Ask us to provide you with an estimate for any of these services. We will be glad to provide you with a free estimate for this timely and useful service. Carpets can be an expensive item to replace and maintaining them is a great value to your health and your investment. Our carpet cleaning service will benefit your health and your wallet. We will remove most spots on carpets and other household furnishings with our usual cleaning process. More intensive spot removal may require an additional service that may be provided if needed. Basic cleanings are very thorough, but sometimes customers have special needs and requests. That’s why we are always glad to create customized cleaning plans. Some examples of special requests are as follows: Inside ovens and refrigerators, window cleaning or carpet cleaning. AAA Getaway Cleaning offers complete cleaning of your oven and refrigerator interiors as well as other specialized services. To schedule this service, please contact your AAA Getaway Cleaning Associate prior to your scheduled service so that we may bring the required cleaning agents and adjust our fee for the additional time. A one-time cleaning includes new construction cleanings, move-in and move-out cleanings, spring-cleaning, and service prior to a big event, and other non-recurring services. All one-time services can be estimated. If additional time is needed, an AAA Getaway Cleaning Associate will communicate with you on this issue. If you authorize additional time, our team member will continue to clean and your price will be adjusted accordingly. We will not use additional time without your prior approval. Please contact Customer Service at (423) 307-3549 if you need to schedule such a cleaning.